Recently we heard a small boy scream with delight in the park at being told of an impending trip to Mcdonald’s. We recognised this child as a kindred spirit. We often say that the best thing about being an adult is the ability to go to Mcdonald’s whenever you wish. To our great sadness and chagrin, there is no McDonald’s within walking distance of our home. Ergo, only a truly special occasion, a trip into London, a desperate need for an item in the vicinity of a McDonald’s, a long train journey, allows the trip. Especially because McDonald’s cruelly cease serving breakfast after 10:30am. Many a panicked moment we have spent with two horrifying options, run or miss out on breakfast. And if you still happen to be there at 10:30 you are privy to the changing of the boards, always an exciting moment. 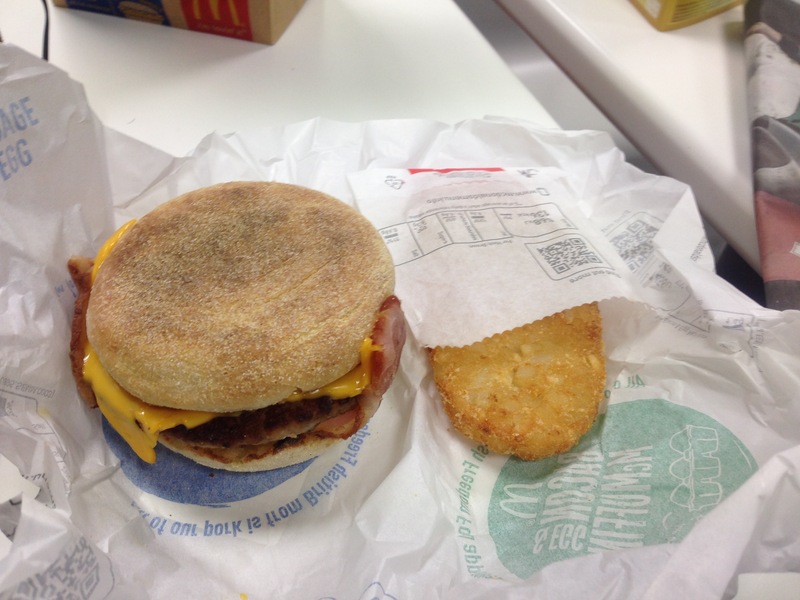 Our usual order is a bacon and sausage egg mcmuffin meal. An esoteric order, it will cost you 40p extra, for the privilege of having both bacon and sausage. The meal entitles you to a hash brown and hot beverage of your choice. Ours is, of course, a latte. McDonald’s lattes are nothing special. 6 on the scale with the highest being Waitrose’s offering. Ensconced within a lightly toasted bun lies a delectable patty sausage then the wonderful layer of fake plastic cheese, the tasty prerequisite of fast food, then the added bacon. The bacon does not quite match Greggs high high standards but is nonetheless sublime. The meal comes with those delicious hash browns. Far too small, they are unadulterated greasy deliciousness wrapped in bread crumbs. Flawless. A perfect breakfast in totality, well worth £3.89. We’ll be returning at every available opportunity.